I have said many times before that I'm not a big YA fan, but ummm if all YA is going to be like this??? SIGN ME UP!! I love it!! 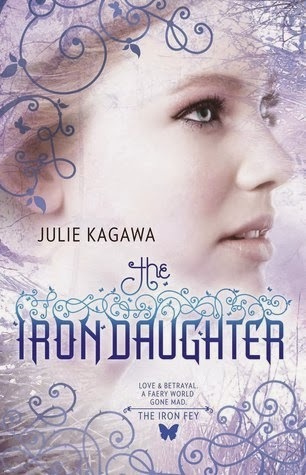 This is the second installment to the Iron Fey series and I'm in love!!! Meghan is at the mercy of the Faere courts * and we've seen how loving they can be*. To really get what happened between her and Ash you have to read the little novella contained in The Iron Legends book, because several important characters are introduced and several things happen that make this story more. Well. this should be easy, then" Puck smirked " We'll just stroll in the front door. waltz up to Virus, grab the scepter have some tea and save the world before breakfast. Silly me thinking it would be hard" Lol yeah it's really just that easy Puck never mind the all powerful scepter, she's too lazy to deal with vermin LOL. I knew at once the Gremlins reaction to her in the moment before battle was an amazing foreshadowing; I mean the fact that Ironhorse showed up to be there for her was a clue but man oh man talk about being obtuse Meghan. So much action takes place in this book and it moves not only the relationships forward but also the story, we meet even more characters that play a major role in Meghan's life and the battle between the Fey loom ever closer with both leaders believing the other is the cause. It's a great divide and conquer strategy, one that would have worked if Meghan didn't exist. There are many moments where my open palm may have wanted to meet several different characters' faces but I managed to restrain myself *just barely*. Once again Julie managed to pull me in and make me love the characters all while wanting to shake them. Yes Ash I'm looking at you, you too Meghan. I loved the love between Meghan and Ash, the Homecoming Dance?? Yeah, Ash is a poet, y'all he's a poet!! I just...the two of them.. it's just yeah I'm gushing I'll stop now. The emotional scene between Meb and Ash, those heartbreaking moment when Meghan thought all was lost to her. Man listen Julie can spin a tale and that moment right there??!!! I might have choked up a little...just a little. I loved me some Ironhorse, I loved how the book was left on a nice cliffhanger so you had to dive right into the next one. I totally marathoning the whole series. I'm so in love with this series. I'm team ASH all the way baby, I love Puck but not for Meghan. And of course this story wouldn't even be a story without Grim being there, this Cat is everything Awesome! !